hi . I want to create icon or button in form editor when i click that it redirect to redirect to other page . please advicce me how to do that ?... 21/12/2011 · I sent myself another email, pressed the track in CRM button, and then instead of converting it directly from Outlook, i pressed the "View in CRM" button to open it in CRM. I then converted it to a case from the ribbon menu from the CRM Email from by pressing the "To Case" button. 19/06/2013 · Hi, Microsoft Dynamics CRM 2011 a powerful business application platform, it enables you to quickly create a fully integrated system for your organization.... 31/03/2015 · CRM Mail Merge Tips: How to Enable CRM Add-in Without Installing CRM for Outlook Connector As we know that we can do ‘Mail Merge’ in CRM. Then you just perform the ‘Mail Merge’ action from the ribbon for the Quote record then you download the Word file. It was created by CRM Developers to convert emails to cases automatically. However, this can be time consuming and expensive. It requires high technical expertise to create and maintain , involving the use of plug-ins and tweaks which frequently lead to performance and incompatibility issues on CRM. 25/07/2017 · If we translate the business need to Dynamics 365 App for Outlook actions, the user needs to track the email, create a new case, perhaps edit some fields, and save. “Converting an email to a case” is therefore a specific scenario of “track and create new” in Dynamics 365 App for Outlook. 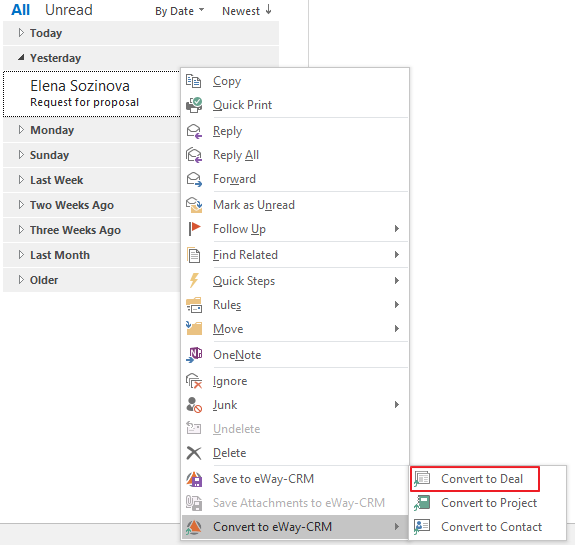 In CRM 2013 I would like to remove from the command bar of an email record the 'To Case' option from the 'Convert To' sub-menu. I have removed the 'To Lead' option from the same sub-menu by modifying a security role so that privilege of the read action for the lead entity is none. 21/12/2011 · I sent myself another email, pressed the track in CRM button, and then instead of converting it directly from Outlook, i pressed the "View in CRM" button to open it in CRM. I then converted it to a case from the ribbon menu from the CRM Email from by pressing the "To Case" button.